By Besus | July 15, 2015 - 3:54 pm | December 18, 2016 Crash Co. 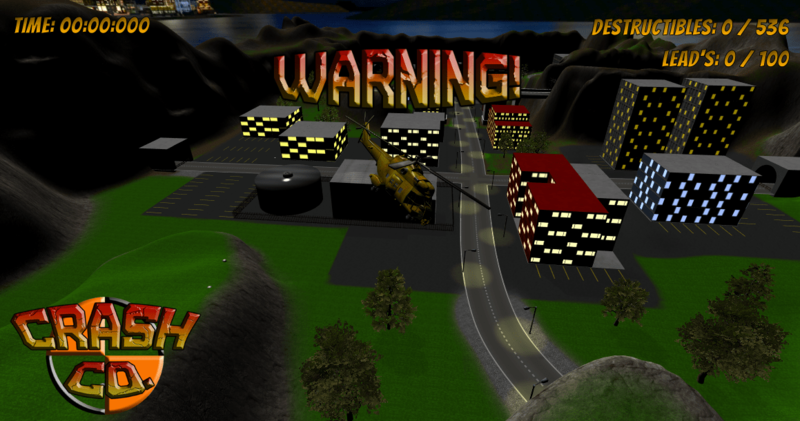 In my journey to create a spiritual successor to Blast Corps, I have added many features to make it more familiar. First-off, the introduction flyby showing you both the map and the objects which will need to be cleared has been fully implemented. Using the objects which I have already set as “in the destruction path”, I temporarily change their material color to red so that they stand out for the flyby. After which the helicopter will fly over the path and lower the player in to their starting vehicle for the level. Next-up is some progress on the levels themselves. I decided to go with a night-themed downtown are as my second level so that I could showcase the building cascade effects (as in you demolish a lower section and the ones above it follow). This was something that I had implemented in the early prototype phase but never got to show-off in the first level (being that it is based in a rural farm/residential area).